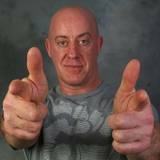 Gary Little began performing comedy in 2003, when he became a finalist in a competition run by The Stand comedy club and the Daily Record. He performed his first one-man show at the Glasgow Comedy Festival in 2005. In 2007, he was briefly jailed for stealing books from the HarperColins warehouse near Glasgow, where he worked as a forklift truck driver, netting £100,000 from selling them cheap on eBay. His prison experiences formed the basis of his 2009 Edinburgh Fringe show He Was Only Jail Gay.